The French President believes the bloc has become the “victim” of the growing tensions between the world superpowers and said it was time for a “true European army” to defend against international threats. And the European Commission backed Mr Macron’s calls saying they were “totally compatible” with their goals. Donald Trump began imposing sanctions on Iran on Monday after pulling out of the nuclear agreement with the nation. 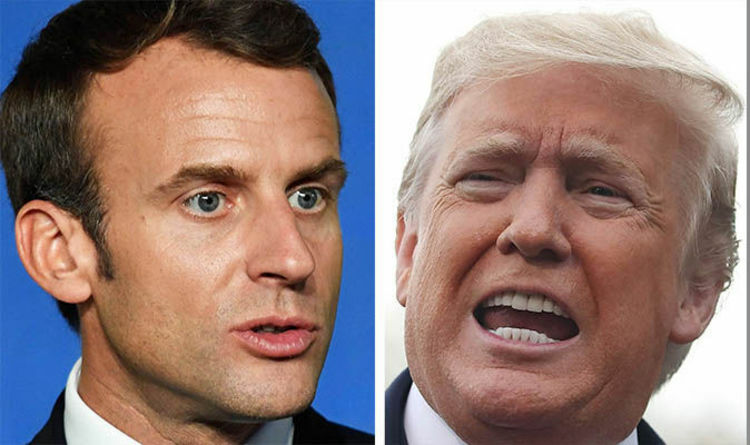 And the 40-year-old French president criticised Mr Trump’s decision to pull out of the 1987 nuclear treaty with Russia banning medium-range ground-launched missiles. Mr Macron said: “We have to protect ourselves with respect to China, Russia and even the United States of America. Mr Macron was speaking in a radio interview in Verdun – the site of a major First World War battle, when he attacked the US President. The European Commission has “very much welcomed” Macron’s proposals for a European army to help “protect” the bloc from external threats. An EU Commission spokesperson said: “If there is a Commission that has put forward the need for a meaningful defence identity for the EU, it’s this Commission. “President Macron has been consistently putting forward this narrative for a stronger Europe that empowers and protects. Tory MEP Geoffrey Van Orden who is a former British Army Brigadier has dismissed the French president’s comments and insisted he should be focussing on strengthening NATO. He said: “Instead of 18th century dreams of French-led European grandeur, President Macron should be helping build Western solidarity. This week week Mr Macron has been on a war memorial tour of north-east France. On Sunday he will host other state leaders including Mr Trump and Mr Putin at an armistice commemoration in Paris.